For years, P&G has led the way in environmental sustainability, diversity and inclusion, and gender equality. Their brands do more than support these efforts; they’re active participants in changing lives around the globe. For this report, we wanted to tell that interconnected story. 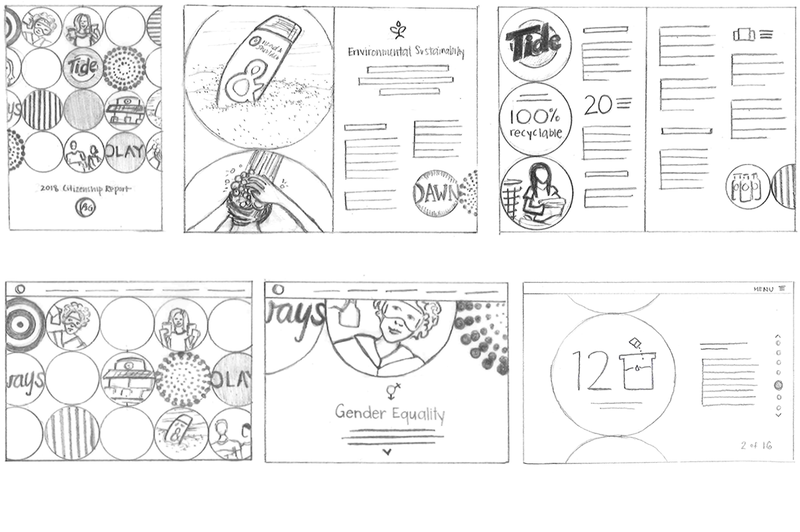 Because the report is so core to P&G’s culture, we worked in tandem with the Citizenship team from the beginning, offering a variety of sketched ideas for presenting their goals and progress. For flexible efficiency, we made sure each proposal could live in print and online. The report shows how brands, employees and consumers are coming together to be a force for good and a force for growth. Citizenship efforts are integral to P&G’s brands, so they play an integral role in storytelling and imagery. 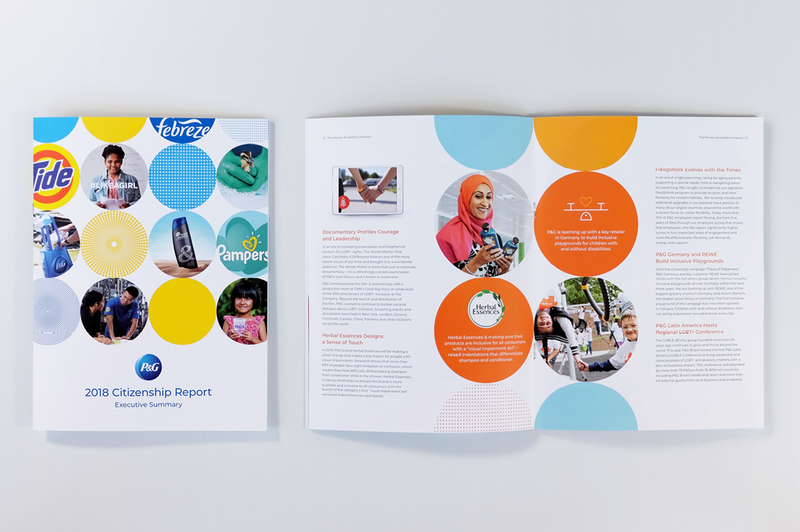 To embrace the positive impact of their interconnection, the report uses a visual identity of connected circles, optimistic colors and energetic patterns. 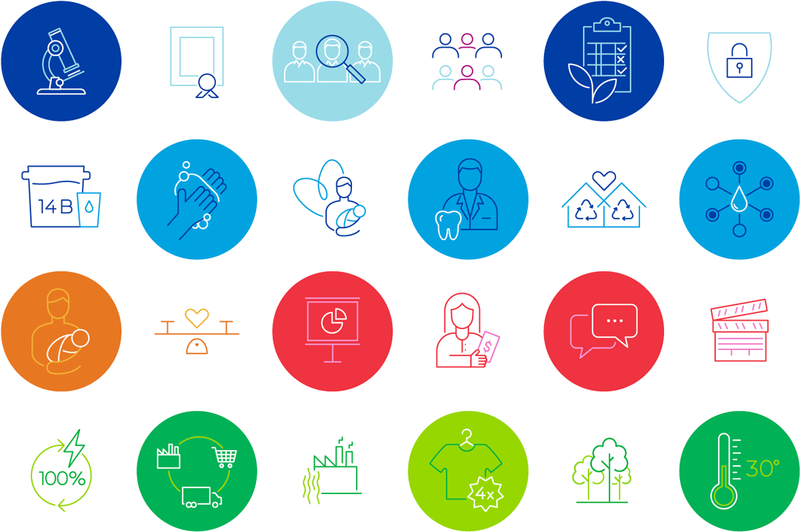 To instantly communicate the essence of complex and often abstract ideas, we used a series of nearly 70 linear icons for the report. These representations illustrated the main points of intricate, involved stories, making the information more accessible and easier to grasp. 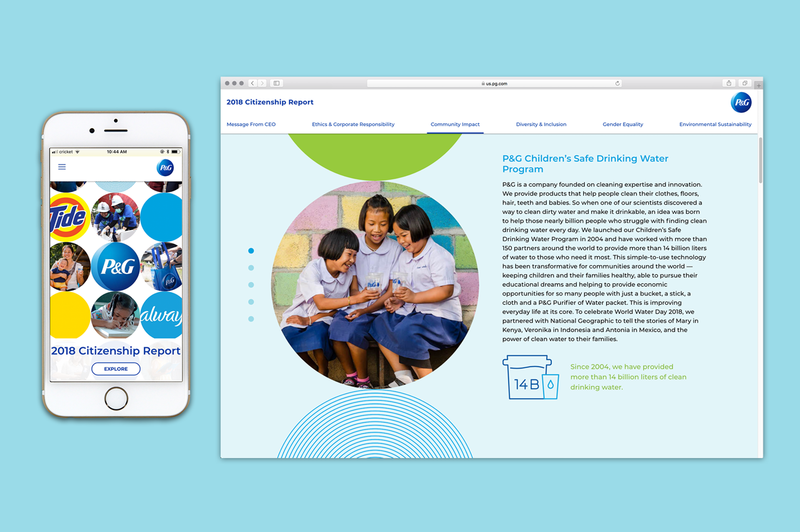 Primax Studio, a trusted partner, helped us transform our executive summary into an accessible and interactive microsite. Designed for mobile and desktop, it also invites users to download the full report. Together with Primax, we translated our concepts and their user experience expertise into a welcoming layout and design. 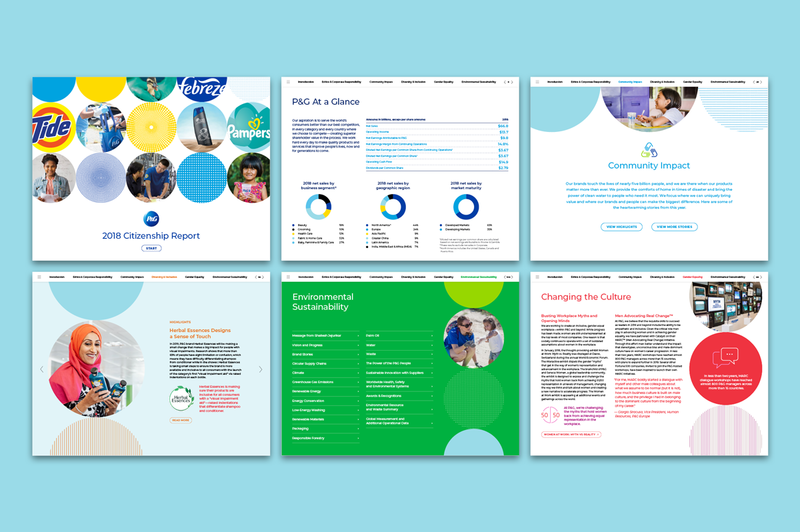 The full spectrum of P&G’s brand palette was needed to tell a complete visual story in the interactive PDF. We used color, icon callouts, interactive navigation and data graphics to make a sea of stories approachable and digestible. Meanwhile, descriptive photography kept the focus on the people who actually feel the impact of Citizenship programs around the globe.